No doubt, it was a horrible murder that took place in the Saudi Consulate in Istanbul, with Jamal Khashoggi&apos;s body possibly sawed to pieces, and according to latest accounts, buried in the Consulate&apos;s backyard. And all that now admitted, executed by order of Riyadh. To soften the blow, for business purposes, some European countries would like to argue that it may not have been a premeditated assassination, but possibly a mortal "accident", which would of course change the premises and lessen the punishment – and weapon sales could continue. It&apos;s all business anyway. Europe has no morals, no ethics no nothing. Europe, represented by Brussels, and in Brussels by the non-elected European Commission (EC), for all practical purposes is a mere nest of worms, or translated into humans, a nest of white-collar criminals, politicians, business people and largely a brainwashed populace of nearly 500 million. There are some exceptions within the population and fortunately their pool of "awakened" is gently growing. Even Switzerland, a neutral country according to her Constitution, not a member of the EU, but a staunch adherent to the (non-) European Union through more than 110 bi-and multilateral contracts, it was revealed yesterday, is assisting in Saudi Arabia converting the Swiss built (civilian) Pilatus helicopter into a ferocious war machine. Pilatus has always had that reputation of its controversial convertibility and was particularly known within Switzerland for that reason – but now, they surpass the limit of the tolerable, by helping the criminal and warmonger Saudis to mount a flying war machine in their, the Saudi&apos;s, country – totally against Swiss law and against the Swiss Constitution, but fully tolerated by the Swiss Government. Back to the real issue: It took the horrendous murder of a famous Saudi-critical and Saudi-national journalist, for the Europeans to react – and that, mind you, grudgingly. They&apos;d rather follow Donald Trump&apos;s line, why lose 110 billion dollars-worth of arms sales to the Saudis, for the murder of a journalist. – After all, business is business. Everything else is a farce. 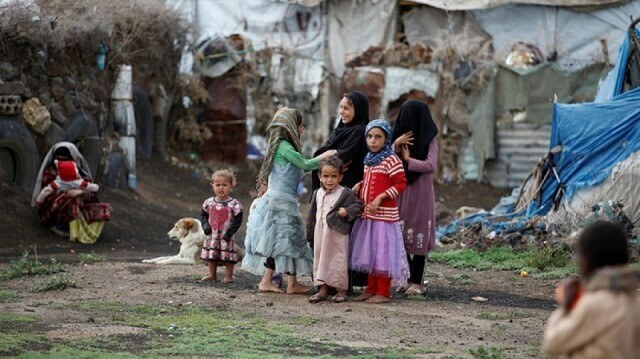 For three and half years, the Saudi&apos;s have waged a horrendous war on Yemen. They have slaughtered tens of thousands of Yemenis – according to the UN Human Rights Commission more than 50,000 children died by Saudi air raids with UK supplied bombs, and US supplied war planes – through lack of sanitation and drinking water induced diseases, like cholera – and an even worse crime, through extreme famine, the worst famine in recent history – as per UNICEF / WHO – imposed by force, as the Saudi&apos;s with the consent of the European allies closed down all ports of entry, including the moist important Red Sea Port of Hodeida. The European, along with the US, have been more than complicit in this crime against humanity – in these horrendous war crimes. Imagine one day a Nuremberg-type Court against war crimes committed in the last 70 years, not one of the western leaders, still alive, would be spared. That&apos;s what we – in the west – have become. A nest of war criminals – war criminals for sheer greed. They invented a neoliberal, everything goes market doctrine system, where no rules no ethics no morals count – just money, profit and more profit. Any method of maximizing profit – war and war industry – is good and accepted. And the west with its fiat money made of hot air, is imposing this nefarious, destructive system everywhere, by force and regime change if voluntary acceptance is not in the cards. And we, the people, have become complicit in it, as we are living in luxury and comfort, and couldn&apos;t care less what our leaders (sic-sic) are doing to the rest of the world, to the so-called lesser humans, who live in squalor as refugees, their homes and towns destroyed, bombed to ashes, no schools, no hospitals, and to a large extent no food – yes about 70 million-plus refugees are everyday on the move, most of them from the west-destroyed Middle-East. Why should we worry? We live well. To the contrary, these refugees they could steal our jobs. Let them not invade our luxury havens. Rather keep bombing their countries into rubble. Yemen, strategically highly sought-for, should, of course, not be governed by the Houthis, a socialist-leaning group of revolutionary Muslims which is part of the Shia Zaidi, a branch of the Shia Imamiya of Iran. They finally became sick and tired of the decades-long Washington manipulation of their government. And who better than the stooges of Saudi Arabia to do the dirty job for Washington? – And, yes, they don&apos;t have to do it alone. Weapon supplies come from all over Europe, mainly the UK, and France, also Spain, and for a while also from Germany – and well, neutral Switzerland. Isn&apos;t that a thought for the illustrious populace who live in western luxury, to lean back in their fauteuils and think about? – What if, one day the tables are reversed – and we, the west would face justice? – Is anybody in the west bold and realistic enough to see such a picture? – And as we see these days – history is advancing in giant steps. It&apos;s the 21st Century – Artificial Intelligence (AI) has more than made inroads in our society. And what if – if those that we consider inferior and our enemies, are in fact a few steps ahead of us in AI science – and could reverse the picture rather rapidly? Why does it take the assassination of a journalist – granted, a horrendous and grisly murder by his own country&apos;s government – no matter how controversial Jamal Khashoggi was, he has been writing for our western MSM, for the truth tellers, such as the Washington post and the NYTimes. That may have helped making him more important than 50,000 slaughtered and maimed Yemeni children – more important in the sense that only through his abject murder, the European – maybe – will react and "sanction" the Saudis.